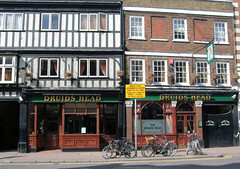 According to the 2011 Good Beer Guide, the upstairs room can be hired, there are smoking areas in the rear garden and on the first floor terrace, food is served noon-9pm every day, and children are not permitted. Last edited 2014-09-14 19:46:16 (version 10; diff). List all versions. Page last edited 2014-09-14 19:46:16 (version 10).